Carbon Monoxide (CO) is a colorless, tasteless and odorless compound produced by incomplete combustion of carbon containing materials. It is often referred to as the "silent killer" because it is virtually undetectable without using detection technology and most people do not realize they are being poisoned. Elevated levels of CO can be dangerous to humans depending on the amount present and length of exposure. Smaller concentrations can be harmful over longer periods of time while increasing concentrations require diminishing exposure times to be harmful. A carbon monoxide detector, or CO detector, is a device that detects the presence of the carbon monoxide (CO) gas in order to prevent carbon monoxide poisoning. CO detectors are designed to measure CO levels over time and sound an alarm before dangerous levels of CO accumulate in an environment, giving people adequate warning to safely ventilate the area or evacuate. Smoke detectors detect the smoke generated by flaming or smoldering fires, whereas CO detectors detect and warn people about dangerous CO build-up caused, for example, by a malfunctioning fuel-burning device. In the residence halls, some common sources of CO include boilers, space heaters, water heaters, and blocked chimneys. 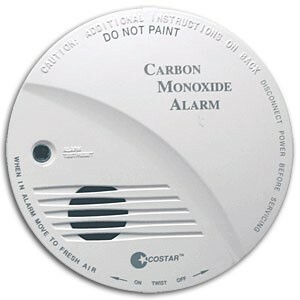 The W&M campus has 140 CO detectors in various locations. The batteries are changed annually during the summer and the inventory is maintained by the EH&S Office.